Reprint. Transferred to digital printing. Originally published: 1998. 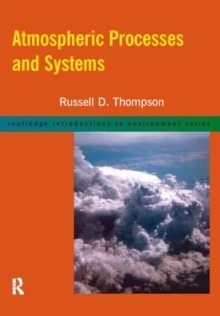 Atmospheric Processes and Systems presents a concise introduction to the atmosphere and the fundamentals of weather. Examining different aspects of the mass, energy and circulation systems observed in the atmosphere, this book provides detailed yet clearly explained accounts of specific phenomena, including: the composition and structure of the atmosphere; energy transfers which take place in the atmosphere and at the earth's surface; the cycle of atmospheric water in terms of evaporation, condensation and precipitation; pressure and winds at the primary or global scale including upper atmosphere circulations and upper air/surface linkages; secondary air masses and fronts; thermal differences and weather disturbances. Each of the sixteen chapters includes a detailed case study. Illustrated throughout with information diagrams and photos, Atmospheric Processes and Systems presents a non-technical introduction to complex themes and processes of the atmosphere which plays such a dominant role in shaping our physical environment and in controlling activities and responses in the cultural environment.